Our visual arts residencies explore a variety of media and techniques, including painting, drawing, papier mâché, collage, assemblage, printmaking, weaving, bookmaking, sculpture, and mosaic art. 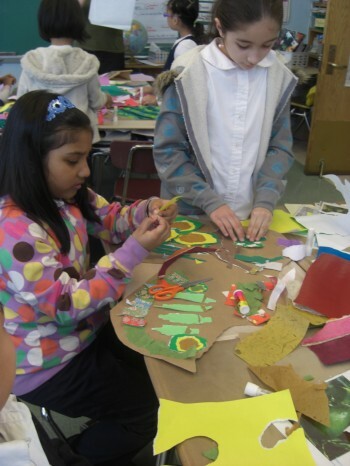 Artists seek to develop students’ art making and literacy skills in the art form as well as their ability to analyze and respond to the visual arts. Students learn the language and techniques of fine arts and of traditional arts forms from master artists and community guests. Field trips to museums, galleries, and neighborhoods provide students with opportunities to experience exemplary works of art and to understand their community and cultural significance. In our visual arts residencies, students have experienced a multitude of mediums and traditions, including: mural painting, making traditional Brazilian literatura de cordel booklets, contemporary book arts, Bengali pattachitra scroll painting, textile arts, Chinese brush painting, tile mosaics, and Puerto Rican vejigante mask making.